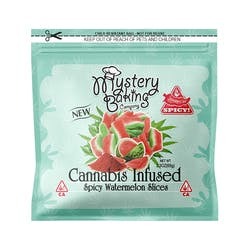 Mystery Baking is a California-based edibles company dedicated to placing the power of edible making in the hands of 420 community. Their line of cannabis-infused edibles are perfect for baking or cooking and are delicious enough to be enjoyed on their own. Whether you’re a culinary artist, a cannabis patient, or simply a marijuana enthusiast, Mystery Baking has the spreadable edibles to meet your needs. 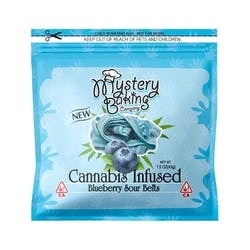 The cannabis community is filled with creativity and thanks to the premium quality edibles on the Mystery Baking menu, the possibilities are endless. As cannabis patients themselves, the Mystery Baking team believes patients should have treatment options; and their high-quality spreadable edibles give patients the opportunity for smoke-free relief. Enjoy one of their infused Honey Stix on the go or prepare a gourmet meal with their Canna Butter. No matter how you chose to use these spreadable edibles, you will experience a consistent high every time. Dive into the mystery and see what you can create with these cannabis-infused ingredients. The founders of Mystery Baking are long-standing cannabis advocates and patients. They entered the cannabis industry while operating a dispensary and cultivation back in 2010. They began to make cannabudder and edibles out of their flowers, and sold their products to other dispensaries in the area. Patients loved their delicious edibles and after awhile of being in the dispensary business they decided to root themselves deeper into the cannabis community by organizing and planning evets, concerts and shows, exhibiting the talent marijuana enthusiasts possess. In 2017, they were inspired to change their direction and get into producing premium quality edibles that allow patients to choose how they medicate. The Mystery Baking team quit their day jobs and went all in! Crafting delicious, accurately dosed and evenly distributed cannabis-infused edibles while they also managed the brand and everyday operations. Their teamwork resulted in a line of best=in-class marijuana edibles that could serve as ingredients to a culinary creation or be enjoyed on their own. The team is comprised of long-time friends, and that spirit shows through their brand. Mystery Baking is approachable, they engage with their customers on Instagram and are developing a cookbook of recipes for their edibles. To this day, the Mystery Baking team still goes hard -- and thanks to the fruits of their labor of love, the 420 community can become cannabis chefs of their own. Consistency and quality are paramount to the Mystery Baking team, and each step of their process ensures patients and adult users get the same experience each time. They begin with organically grown, pesticide-free San Fernando Valley OG flowers from their cannabis garden. Those top-shelf buds are then processed with CO2 extraction to yield clean, potent, and active cannabinoid distillate. Then Little B applies his magic, infusing their line of delectable ingredients with their premium SFV OG distillate. The Mystery Baking menu is perfect for stoners of all walks of life. 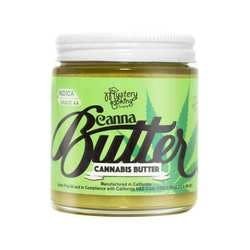 Culinary artists can get creative with their Canna Butter, which is one of the most potent items on their menu. Each 4-ounce container packs 1000 mg of active THC. Not the best cook? No worries! With Mystery Baking you can make the peanut butter and jelly sandwich of your dreams. 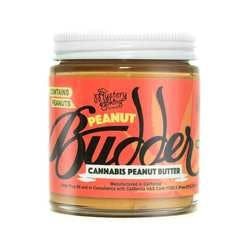 Their infused Peanut Butter comes in 4-ounce jars with 1000 mg of THC and they offer two yummy 300-mg-per-jar preserves: Grape Jelly and Strawberry Jam. Sweeten your relief with Mystery Baking’s infused honey. Take home a jar of their original Honey or enjoy one of their flavored Honey Stix on the go. These discreet treats come in Orange, Original, Strawberry, and Grape. 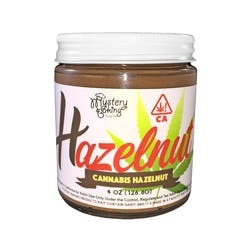 Last but not least is the Mystery Baking Hazelnut spread. Give yourself the best morning ever with a dollop or two of their 300-mg-per-jar Hazelnut spread. The myriad of ways the cannabis community will utilize these tasty ingredients remain a mystery. Check out their menu and see what inspirations appear in your mind. 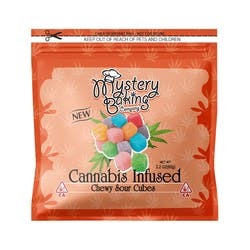 Mystery Baking is pleased to offer lab tested cannabis-infused edibles provided by SC Labs to guarantee patients and adult users have access to safe, pure, and accurately dosed edibles. These are perfect edibles for me- litle micro dose great taste. i find the dose/taste ratio awesome- these are the BOMB!! !